Our friends from Private Picassos host lots of fun adult classes at their studio on 5th Ave in Park Slope and in venues around NYC, and we wanted to let you know all about them! 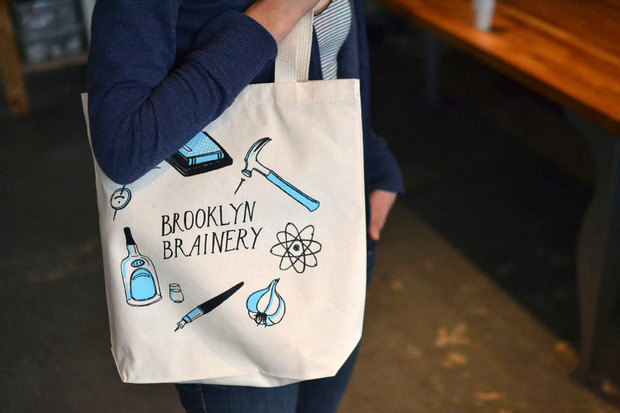 We have a big box of Brainery totes and decided to offer them up on super sale! You can order one for $10 and we'll ship it to you free. They're designed by the wonderful illustrator Kaye Blegvad, and there are limited quantities, so be sure to grab one soon. This month, Bushwick Street Cats will receive this month's donation of 5% of our monthly gift certificate sales. Bushwick Street Cats is an all-volunteer nonprofit dedicated to reducing the free-roaming cat population in Bushwick (and the surrounding area) through the use of Trap-Neuter-Return (TNR). Whenever tame cats are found during the TNR process, they're fostered and found homes.